Russian ballet and opera are a must-do while visiting Russia if you want to experience the local culture at its very best. Russia is famous for its ballet and every traveler who visits Saint Petersburg and Moscow should really watch the ballet and opera evenings, even if they are not avid fans, or have never ever seen one. Personally speaking, attending one of the many ballets and opera performances in the imperial city can be the highlight of your Russian trip. Over the past years Anastasia and I, have attended different Russian ballet performances, and each time it turned out to be an unforgettable experience. 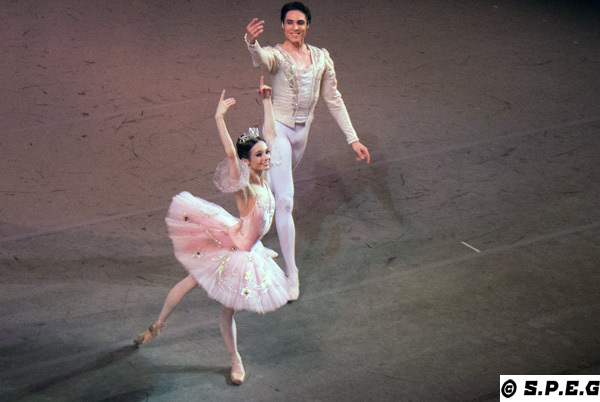 There are few theaters in St Petersburg where you can enjoy the timeless classic balltes known and loved throughout the world, such as Swan Lake and The Sleeping beauty, or The Nutcracker and Spartacus, or La Bayadere, as well as other ballets like Giselle and Cinderalla. All of the top performances are featured inside stunning historical buildings, so as soon as you step in you will be also impressed by the extraordinary architecture and elegant interiors of their theaters, which have become an attraction themselves. Ready to go? If so, check out our picking list of top venues below, and choose where to go. Located in the beautiful Baron von Derviz mansion the St Petersburg Chamber Opera Company features many world-class soloists accompanied by an outstanding orchestra. The company has deservedly won many prestigious prizes and many of the talented soloists are Honoured Artists of Russia. The repertoire includes the finest classical Russian and Western European operas covering every operatic genre from comic opera and opera-buffa to musical drama and pieces by contemporary composers. Take time to enjoy the beautiful interior decorations of the mansion too! What's nearby: St. Isaac Cathedral, Naval Museum, Neva River Embankment, Hermitage. Extra info: Everyone knows the Marinsky but you should come here and watch La Traviata for a unique performance. Established over 250 years ago, the Aleksandrinsky Theatre has always been the symbol of the Russian State and until 1917 used to be Russia’s main imperial theatre, with the Emperors taking great personal interest in its affairs. It’s in this theatre that almost all premieres of Russian classical plays have taken place. Re-designed and unveiled in 2013 the theatre now boasts a unique high-tech stage complex including 4 auditoriums of different sizes with the addition of The Roof which hosts poetry readings, concerts, and film shows. This theatre was awarded National Treasure status in 2014. Metro: Gostiny Dvor / Nevsky pr. What's nearby: Ulitsa Zodchego Rossi (Street of the Architect Rossi), Anichkov Palace, Nevsky Prospekt, Monument to Catherine the Great, Sadovaya Ulitsa, Fontanka River, Malaya Sadovaya Ulitsa. Extra info: The Alexandrinsky Theatre is the second most famous theatre in St. Petersburg, home of the oldest theatre company in Russia. Mikhailovsky Theatre is one of Russia’s oldest opera and ballet houses, founded in 1833, and named after Grand Duke Michael Pavlovich of Russia. The theatre is situated in Mikhailovsky Palace which was his residence and received high-ranking guests of the Imperial Family and close friends. It’s a relatively small, but cosy and elegant venue presenting dance and opera performances. The acoustics are excellent and the Mikhailovsky is considered one of the noblest theatres of opera and ballet in St Petersburg. What's nearby: Italyanskaya Ulitsa, Mikhailovskiy Palace (State Russian Museum), Griboedov Canal, Shostakovich Philharmonia. Extra info: The Mikhailovsky Theatre is slowly pushing its way to the forefront of cultural life in St. Petersburg, beginning to rival even the mighty Mariinsky Theatre with its repertoire of classic ballet and opera. "A Magnificent Aristocratic Venue for Russian Ballet"
The Mariinsky Theatre is a monumental neoclassical building that features beige marble, Swarovski crystal lights, backlit walls of translucent onyx, and picture windows offering city views. The auditorium is a horseshoe shaped creation of beech and oak, with scalloped ceiling and slatted box fronts edged with crystal. From every seat the sound and sight lines have been optimised. This is the home of the world-famous Mariinsky Ballet, Mariinsky Opera, and Mariinsky Orchestra. There are 3 Mariinsky buildings, so check tickets to ensure you go to the correct venue. Definitely a must-see! What's nearby: Kryukov Canal, Rimsky-Korsakov State Conservatory, Ulitsa Dekabristov, St. Nicholas Naval Cathedral. Extra info: The Mariinsky Theatre is some distance from the metro. To walk from Sadovaya, Sennaya Ploshchad or Spasskaya metro stations takes around 20 minutes. If you are coming from Nevsky Prospekt, it is easier to take a bus (27) or trolleybus (3 or 22), from the north side of the street (odd numbers). Dedicated to the past traditions of the Golden Age of Russian ballet, the Hermitage Theatre provides a unique experience for patrons. Each traditional ballet is beautifully performed, and the fine symphonic orchestra offers an insight into the glory times experienced by crowned heads of state in Imperial Russia. Situated on the Neva River Embankment this is a jewel of a theatre once the personal theatre of Catherine the Great which has been restored to its former grandeur. Carpeted floors, red velvet chairs, beautiful lighting and décor make this a venue and experience not to be missed. What's nearby: Nevsky Prospekt, Palace Bridge and Palace Embankment. Extra info: The theatre is particularly worth considering during the summer months, when the Mariinsky is closed and many of its top performers can be seen here instead. If you're thinking to visit one of the theaters presented on this page, you can buy tickets without mark-ups through their official website. This is the easier, safest, and cheapest way to get your tickets for the Russian ballet. If you don’t see any tickets on-line try to check the theater’s ticket box office or some ticket-offices in the city a few days before going. Be aware that theaters post their play-bills about three months in advance. So when a middle-man offers you tickets half a year ahead it’s time think twice. This leads me to say... avoid purchasing your tickets through third-party websites as most of the time you may end up paying much more than the offered regular price. With that in mind, if you still need help with buying your tickets, feel free to get in touch with us, and we will buy them for you. We recommend that you buy tickets for these leading theaters in advance, especially during the high tourist season (May – September). Make sure you arrive early so you can soak up the atmosphere. Make sure you have a taxi booked and waiting when you leave as there can be quite a scrum. Try not to take bags and coats as you have to deposit them at the cloakroom and it can take a significant period of time to retrieve them at the end of the performance. Usually photos are not permitted and the staff may point red laser lights at anyone breaking the rules. Regardless of where you go, remember to dress well (no ripped-off jeans, sneakers, and t-shirts), come early, and eat before you arrive as food served at any of these theater is overpriced. Also, keep in mind to buy tickets in advance to reserve the best seat (the first row of any balcony or the back row is your best choice).